Fourteen year old Apsara Maralande of Mahamaya Girls College, Kandy is one of the most promising athletes in the hill capital and possibly in the country today and her performances has brought her a rich haul of medals during her brief period of participation. A section of the famous Maralande sporting family in the hill country who excelled in many sports for Trinity College and the country especially at cricket. Percy Maralande captained the Trinity College cricket team for three years from 1920. He captained the team in 1920, 1021 and 1922 and won the big match against St Anthony a College in all three years. Then Nimal Maralande captained Trinity in 1958 and 1959 but he is better known in the rugby field having represented the national team with distinction. Apsara Maralande shot into fame in the local athletic scene with some dazzling performances both at the Zonal and Provincial level and her forte has been the short distance running. Winning at the local competitions was a mere formality for her. Last year at the Junior National Championships she won the first place in the 100 metres and the 200 metres. In 2010 at the 100 metres event of the Asian Junior championship held in Vietnam she was placed sixth. The same year at the Junior national championship she timed 12.29 seconds in the 100 metres sprint creating a new record. This was a record which stood for 26 years and the earlier record holder was Tania Vanheer who timed 12.30 seconds. 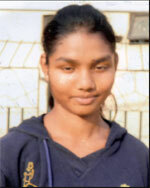 At the first Asian Youth Games she was a member of the Sri Lanka 4 x 200 metres relay team which was placed third. Her performances brought her the honour of being appointed captain of the Sri Lanka Youth team which participated in the World Youth Championship 2011 in Isle of Man. In Apsara Maralande Sri Lanka has a promising athlete who should shine in the future.